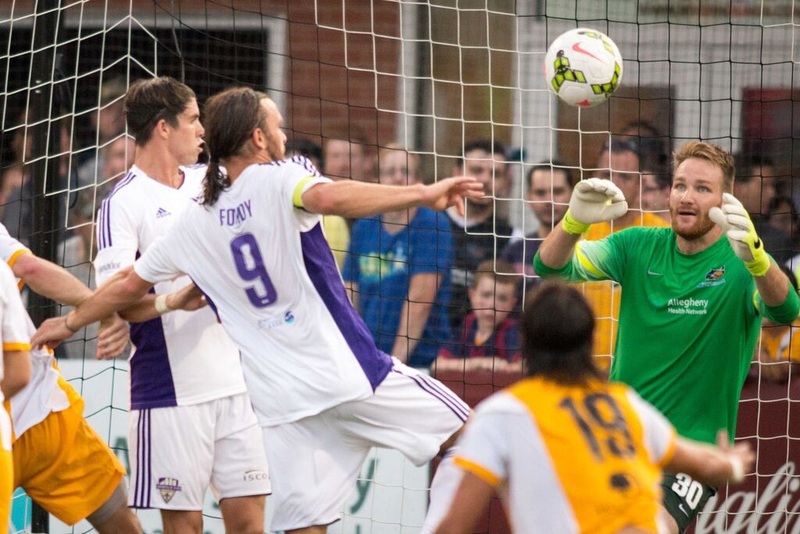 The Pittsburgh Riverhounds lost their second consecutive game, 2-1, to Louisville City on Saturday night, before a sellout crowd at Highmark Stadium, as goals by Magnus Rasmussen and Matt Fondy proved to be the difference. On an eventful night when the Riverhounds honored Gibsonia’s Meghan Kingenberg — starting outside back for the FIFA Women’s World Cup Champion United States Women’s national team — they turned in one of their most disappointing efforts of the season in losing a key match against a team that leads them in the USL Eastern Conference standings. Riverhounds Head Coach Mark Steffens was clearly disappointed after the match. “We really couldn’t get any rhythm going. We weren’t able to create many attacking chances and — a couple mistakes in the back again cost us,” said Steffens. For the second game in a row an early miscue by Fejiro Okiomah forced the Hounds to have to play from behind. After the Riverhounds controlled much of the possession in the early stages, Louisville City benefited from a mistake by Okiomah in the 14th minute, as he completely missed a kick to clear a bouncing ball away. Magnus Rasmussen took advantage of Okiomah’s miscue, getting behind him with possession of the ball to make a run toward the top of the box. Okiomah caught up to Rasmussen, but was called for a foul as he pulled him down. Referee awarded Louisville City with the free kick from 21 yards just inside the center arc outside the box. Rasmussen’s kick was perfectly placed past the Riverhounds wall and into the left side of the goal to give the visitors a 1-0 edge. 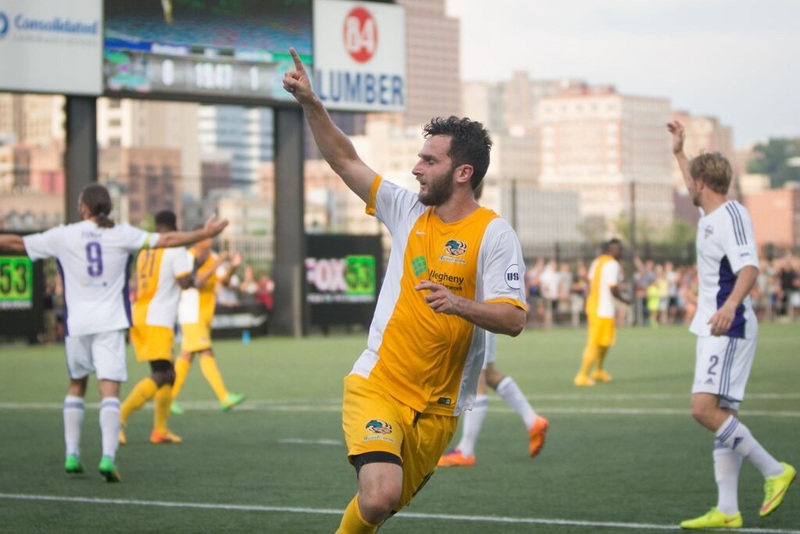 The Riverhounds responded like they have most of the season. With the combination of Rob Vincent and Kevin Kerr. Kevin Kerr’s scored his 8th goal of the season in the first half to tie the game. ards on the near sideline. Vincent sent a low lining ball toward the near post that connected with Kerr, who made a perfectly timed run to head the ball into the goal for the equalizer. “I wanted to get it toward the near post. See if we could get the goalkeeper to come out for it. Kevin made a great run, and was able to direct it in,” said Vincent. 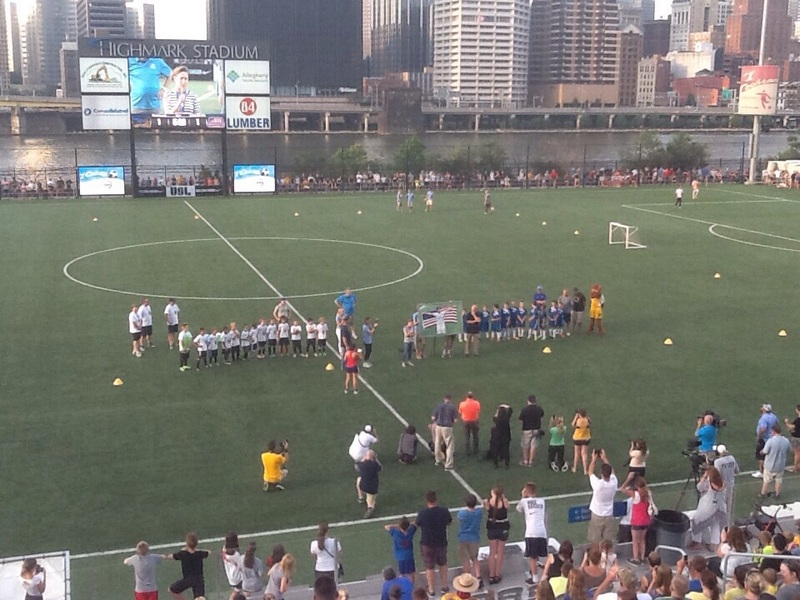 Despite the goal to bring the score level, it wasn’t able to carry over and give the Riverhounds the momentum they were looking for to seize the match before a packed house. We went a little bit off the pace a bit tonight. We tried connecting passes. I don’t think it was any one thing. We just couldn’t find a way to do it tonight,” said Vincent. Louisville City stymied many of Pittsburgh’s attacking chances throughout the match played on one of the warmest nights of the summer. In the second half, LCFC began to control much of the play, and capitalized when Bryan Burke took a hard, low lining shot toward the goal box area, where Matt Fondy quickly redirected the kick past Riverhounds goalkeeper Calle Brown for his 11th goal of the season. The best chance of the second half for the Hounds likely came in the 81st minute when Kerr made a nice move to send a right footed shot at Goodwin, that was turned away. Amara Soumah was in position to put the rebound back, but he couldn’t get a clear shot at the goal. The Hounds, now 7-7-4, couldn’t muster another shot the rest of the way as they have now entered a tough stretch in what’s been an up and down season. “I feel we should be a couple games better at this point. We’re going to have to play better. At this point, we’re not a playoff team. We not playing like we deserve to make the playoffs,” said Steffens. Brown (G), Anthony Arena, Willie Hunt, Sterling Flunder (Lebo Moloto), Fejiro Okiomah (Amara Soumah), Danny Earls, Kevin Kerr, Rob Vincent, Stephen Okai (Matt Dallman), Drew Russell (Miro Cabrilo) and Mike Green (Boris Zivanovic). It will be the first rematch in the Keystone Derby next Sunday since the Riverhounds had a remarkable 6-5 come-from-behind win against Harrisburg City Islanders. It will be a very important game with playoff implications as the Hounds remain slightly ahead of Harrisburg in the standings for the last playoff spot in the USL Eastern Conference, as Harrisburg lost to NY Red Bulls tonight. The Hounds honored US Women’s World Cup winner and Pine Richland grad Meghan Klingenberg, during a halftime ceremony in which they provided her with a framed photo of her holding the United States flag after winning the Cup. Klingenberg signed autographs for fans in the Suite Club before the game, and was grateful for all of the support. “It’s surreal that you are all here to see me,” said Klingenberg as she began the autograph session. During the ceremony she added.